This is a close up of the delicious and tantilizing scents donated by Steambath Factory. They include "Old Lace", "Mutiny", "Cemetary Roses", "Raygun" and "Time Traveler." Old Lace- Echoeing romance, victorian lace gloves grasp delicate, fragrant violets. Mutiny- Passion and adventure await you with coconut, pirate’s rum, island spice and salty sea air. Prepare to be boarded! Cemetary Roses- A haunting blend of dusty roses and fresh wild lavender. Raygun- Wicked and wonderful, orange, grapefruit & tangerines burst with touch of lime, tea leaves and cinnamon. Conservatory- a proper, yet highly provocative blend of wood, coffee & old books with hint of cardamom, ginger & exotic Indian patchouli. 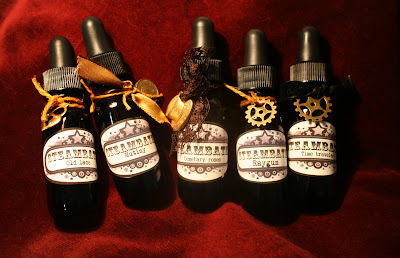 In addition to these prizes, samples of the new scent "Conservatory" have been donated as well so keep an eye out for the samples being handed out at the Pre-Party and at Austin's Elysium Steampunk Ball!